Food & Vogue Caterers - Service Provider of birthday functions, anniversary party & theme parties in New Delhi, Delhi. Celebration of Birthday has always remained a most desireable wish of every Child, Parents of newly-born babies, near and dear friends, close relatives, colleagues of any individual.Give your party a creative spark with fun, whimsical and unique invitations! We have a great selection of kids birthday party invitations, theme party invitations, children’s personalized stationery, gift enclosure cards, kids stickers, return address labels and so much more! We offer you our complete range of services from planing the party, organising, decoration, co-ordinating the event to the last detail, catering, entertaining and taking care of the guests. We as a planner, are responsible for creating a welcoming ambience at the venue, so that everybody participating in the event has an extraordinarily enjoyable time. Every moment that you spend with your spouse is a special moment and as years pass by we carry many beautiful memories with us. Celebrating each passing year of your married life is an extension of your love for each other and of your happiness to others. Anniversary celebration in style is the best way to host your party. You can choose either to have an indoor setting in the banquet hall or you can have your anniversary celebration in the beautiful lush green gardens around the hall that provides an authentic and natural setting. It is an ideal place for open lawn parties with bonfire and dance floor. We are providing catering services both for corporate parties and family occasions. Our food is excellent since we have been catering to the elite class of society and we never compromise with the quality and hygiene. We have been serving better than the best food at the most competitive price. Our outdoor catering service is meticulously tailored to cater to your preferred choice of settings. Once you come to us you can be totally tension free about your food and you will be served the best quality food according to your taste. We also prepare exotic theme menu during the festive seasons. We are here to take utmost care of your requirement and you can be sure of a sumptuous food. Steadily, the sphere of our outdoor catering service is growing and we are receiving words of appreciations from our clients. Wedding is a time to celebrate and wedding reception party is the time when family and friends get together to participate in your happiness and joy. Wedding marks the beginning of a new life and hence, the new life should be greeted in a grand way with Wedding Reception Decorations. Wedding Reception Decoration has to be interesting and really beautiful. 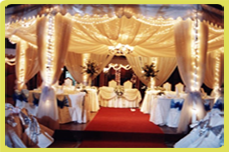 We are here to help you with some bright ideas for decorating a wedding reception hall.You may carry the theme of the wedding to the reception hall as well. If you have used a particular color scheme for the wedding ceremony, consider using it for the reception too. However, be sure to bring in some variations in the decoration, so that both the venues do not look identical.